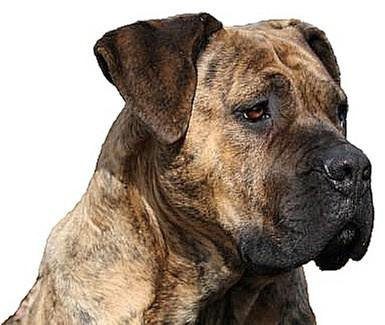 ﻿The South African Boerboel is the only working mastiff in the world bred solely to guard and protect. The temperament of the Boerboel is its most attractive and most important characteristic. The Boerboel is the only breed in the world bred with only one purpose, ie to guard and protect the family. These mastiffs are physically and mentally able to complete any task required of a farmer in South Africa, undoubtedly the harshest country in the world. The Boerboel is a confident dog who is not nervous or jumpy and does not bite out of fear. A Boerboel is able to recognise your fear, which any Boerboel owner will confirm. Because the Boerboel is primarily a family and property guardian, he is happy in the family environment where he can establish his area to call his own. He is not prone to wander or bark without reason, rather he stays close to his family home, quietly doing exactly what he was bred for. The Boerboel should qualify himself as your best friend. He should know when you approve or disapprove of a person and share your feelings. The breed has been developed to be completely at ease around friends and family, not hyper or outwardly aggressive, yet an intelligent and loyal companion who is willing to lay down his life for his family. The Boerboel will accept the whole family, not just one person, as their master because they feel their primary duty is to respect and protect all of you. Boerboels are usually good companions for children, he is a child's friend and playmate. Many stories have been told about a Boerboel spending hour after hour guarding a little baby in a pram. He feels the whole family belongs to him and his sole purpose is to protect them, with his life, if necessary.